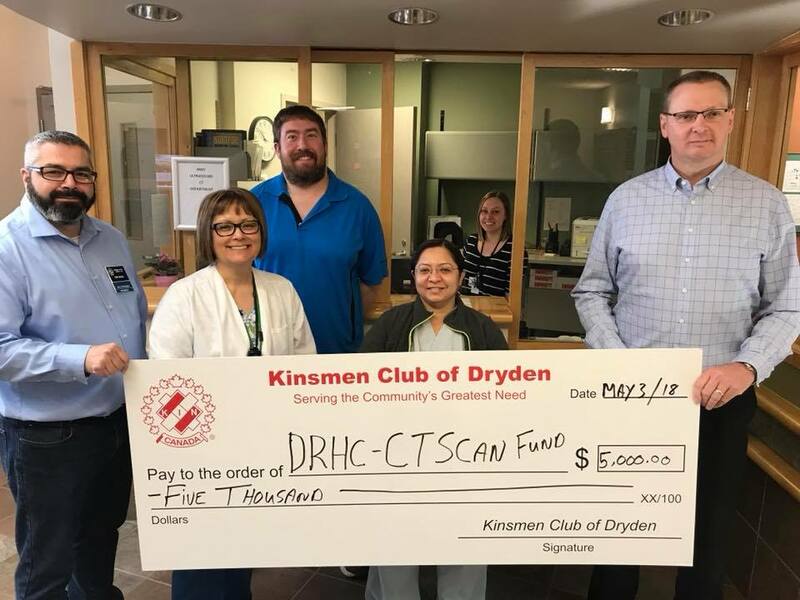 Recently, the Dryden Kinsmen were proud to present a cheque for $5000 to the Dryden Regional Health Centre to aid their efforts in replacing their CT scanner. The current CT scanner is at the end of its life span and is no longer operable. This is a vital piece of equipment as it allows emergency diagnostics to be performed locally, without residents having to travel several hours to nearby Winnipeg or Thunder Bay for medical service. Unfortunately, the government is unable to provide funding to replace this important piece of equipment, so the health centre must rely on fundraising efforts from local service groups like the Dryden Kinsmen to raise the money needed. Great job to the Dryden Kinsmen for their hard work and generosity in serving their communities greatest needs.